Specialised treatment for a life without pain. Non-invasive treatment for improved healthcare. Ask for Bioflex by name. 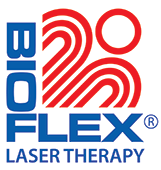 Bioflex Laser Therapy is the safe and effective way to eliminate pain and accelerate healing. This technology utilises super luminous and laser diodes to irradiate diseased or traumatised tissue with photons. These particles of energy are selectively absorbed by the cell membrane and intracellular molecules, resulting in the initiation of a cascade of complex physiological reactions, leading to the restoration of normal cell structure and function. BioFlex treats a broad range of medical problems relating to the musculoskeletal system, arthritis, sports injuries, dermatological conditions, non-healing wounds and diabetic ulcers. It is an excellent treatment for those patients who are not responding to conventional medicine or manipulative therapies. In comparison to traditional treatments, patients recover from musculoskeletal and peripheral nerve injuries with less scar tissue, accelerated cell regeneration and improved function. Disc Herniation, Fibromyalgia, Post-Herpatic Neuralgia, Reflex Sympathetic Dystrophy, Diabetec Neuropathy, etc. Dermal Ulcers, Diabetic Ulcers, etc. Contact our dedicated team and renew your lease on life.